I have used Skype (application used to make voice/video calls over the Internet) for the last several years and generally been very fond of the application. Recently, Skype seems to be trying to move into a social media space with the introduction of their new “Skype Home” functionality. This little and annoying pop-up occurs every time the application is started. Therefore, every day I have to close this little annoying pop-up window that often comes with an advertisement to purchase something that I am already buying from Skype. I am sorry and do not wish to nitpick, but I am already a paying customer. Please give me the ability to turn this off. I have scoured the net and only found numerous people complaining about the same irritation and multiple step work around that are more trouble then closing the window. See I am not the only one upset by this “feature” and not really that crazy after all. I regularly update the application hoping beyond hope that there will be a feature or function that will allow me to turn off this annoying and failed integration point to social media. Skype should focus on being the best VOIP computer-based application and give up trying to integrate with social media platforms. Sorry for the rant, but it is just really bugging me tonight, for some strange reason. If you know how to disable this function, please share it! You will have my eternal gratitude. I love the “Give Feedback” icon at the top of the pop-up window – okay, let me try this. Dear Skype, please allow me to disable or remove the Skype Home functionality. Also, please consider responding to the 200+ pages of feedback (multiple threads now, but I linked to the first one I found) in your community support forums expressing the same frustration and request. Feedback given… I feel a little better. 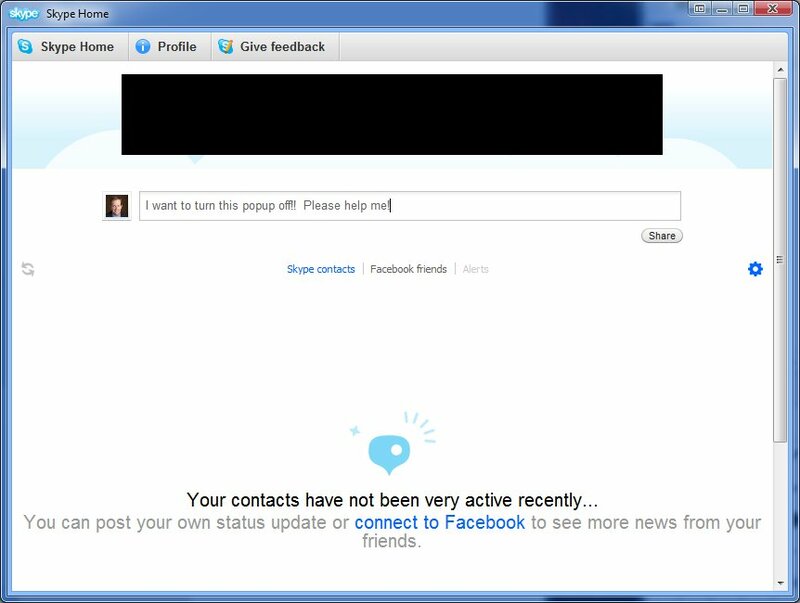 I found a small Facebook community (Disgruntled Skype users who hate the ‘Home’ popup) about this as well. We all need to let Skype know that the users should have the option to use the feature or not. People, fire up those Twitter, Facebook, “Feedback” and forum accounts!! You’re not alone, my friend. You are not alone. I have even checked out Google Voice because of being so annoyed about Skype Home. Sigh, typical of applications being victims of their own success. I have been looking at Google’s voice as well.